The desktop email client Thunderbird has been updated to version 60.5.2 on February 25, 2019. The new Thunderbird 60.5.2 comes as an update for all previous versions of the software. Thunderbird 60.5.2 fixes a crash issue and a certificate verification issue with Outlook emails. Thunderbird displays an "update available" notification when you start it by default if a new version is available. You may use it to download and install the new version right away. You may also select Help > About Thunderbird to manually start the process and verify the installed version of the email client. Thunderbird users who prefer to download the new version manually instead can do so on the official project website. Thunderbird 60.5.2 is a bug fix release that addresses several issues, including one crash issue, in previous versions of the email client. The new version has been available since February 25th, but the release notes were not available at that time. The official changelog lists three issues that have been fixed in Thunderbird 60.5.2. The team fixed a crash issue in Thunderbird on Windows. Thunderbird could crash when users selected Send To > Mail Recipient in Thunderbird on Windows. UTF-8 support was added to MAPISendMail. A fix for S/MIME certification verification when receiving email from Outlook. The issue was introduced in Thunderbird 60.5.1 and has been resolved fully in the new version. The changelog lists two known issues; these are not new, as they have been introduced in previous versions of the email client. Thunderbird 60.5.0 had the same issues. Twitter chat is not working due to Twitter API changes. Profiles stored on Windows network shares are addressed via UNC. 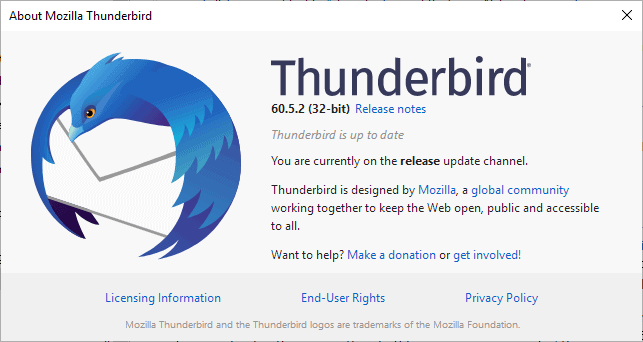 Thunderbird 60.5.1 was released on February 14, 2019. It is a release that fixes security issues and fixes CalDav support for some servers. The changes of that release are incorporated in Thunderbird 60.5.2. Now You: Which email client do you use currently? Does Thunderbird integrate with Windows 10 notifications? I’d like to have Thunderbird constantly running in the background and notify me of new messages. A couple of years ago when I used Thunderbird, I just had it run on startup and used an extension that minimizes to tray. Has that improved in any way or do I still have to follow the same steps? It gives me notifications all the time, minimized or not, as long as it’s running. There’s a tab to customize how notifications appear, the extent of verbiage, sound or not, how often to check, etc. Thank you. I meant does Thunderbird have the option of running in the background without it being in taskbar and maybe just a systray icon. I think I’ll give it a go today, I always wanted to use it. Nothing has improved in that regard, it’s even worse. It runs in the background only if minimized on the task bar. The old extensions don’t work with the new version, so no tray option whatsoever. I don’t understand why they keep that corpse walking?! Very surprising considering the nature of the software and its user experience. I never understood why they haven’t addressed this, I mean even browsers leave an agent running silently in the background for update processing and notification. Yes, the tray situation with Thunderbird is awful, as it always has been. I use PopTrayU email notifier along with Tbird v.52.1 (if it ain’t broke, don’t fix it). With PopTrayU, you don’t need Tbird running. Gives a sound notification and shows previews for all accounts. Very easy to set up. I use TB 52.9.1 because it’s the last XP version, so I can use TB in my XP VirtualBox install running legacy software (fast). So… do the recent TBs use the 52.9.1 file formats, so just the UI is improved for each update, or is the file format changed too? This version give me MAPI errors when traying to send mail from Word or Adobe PDF in several computers. Any fix? So… like Firefox, the Thunderbird developers have removed the option to completely turn off updates. I, personally, have the self-discipline to remember to check for updates once in a while. I refuse to use ANY software that forces updates on the end user. I’ll continue to use the older version of Thunderbird until it’s no longer possible to do so. Welcome to the world of “Idiocracy”. Thunderbird is not forcing updates. It’s just notifying you that an update is available. It’s annoying that you can’t disable that notification, but nothing more. To fix Send to Mail Recipient download the full 60.5.2 installer, install over existing version, reboot computer. Would you like to review UXP-based Interlink Mail & News?